Table Tennis Scotland and Age Scotland have launched a joint initiative aimed at encouraging older generations to become more physically active by taking part in table tennis sessions. The programme is based on pop-up table tennis halls, which will initially be open between 11am and 2pm for seven days a week, with a team of table tennis volunteers on hand to help people get started. 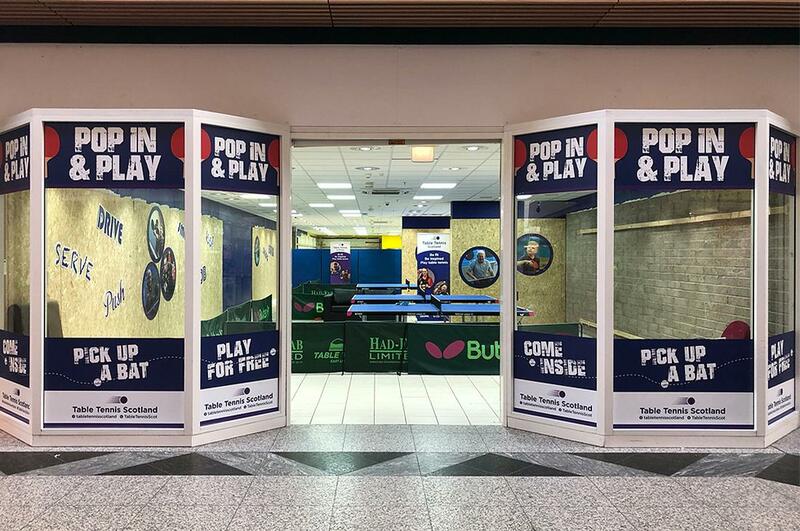 One of the first pop-ups was set up at an empty unit in the South Gyle shopping centre in Edinburgh. South Gyle provided the space free of charge and a local club – Murrayfield Memorial Table Tennis Club – took a lead on behalf of local clubs in organising the volunteers to supervise the venue. As well as playing on the tables, passers-by can access information on a range of other activities including local walking groups, walking sports, local clubs and how to make contact with dementia-friendly classes. Martin Hayman, Table Tennis Scotland community project manager, says the pop-ups have been designed to attract the entire family. “It is a fantastic inter-generational sport," says Martin. "Parents and grandparents can play with their children, getting the whole family involved. Studies show that, as a low-impact sport, table tennis offers many health benefits for the elderly, as it gets the heart and muscles working on a regular basis. Table Tennis Scotland is keen to promote the message through the venture. “Table tennis is an excellent activity to get people active again," Hayman adds.